Textiles have been produced by almost every advanced culture over the centuries - the Hellenic Mesopotamian, Egyptian, Achaemidian, Sassanian, Assyrian, Chinese, and Indian. But, they have hardly been the focus of serious study. Silk Brocades promises to remedy that. Rummaging through the cupboard of Indian history, it finds patterns that have persisted through three to four thousand years, textiles imbued with religious symbols, silk-weaving centres which were the incubators of the tradition, and royal workshops that created the finest brocades. 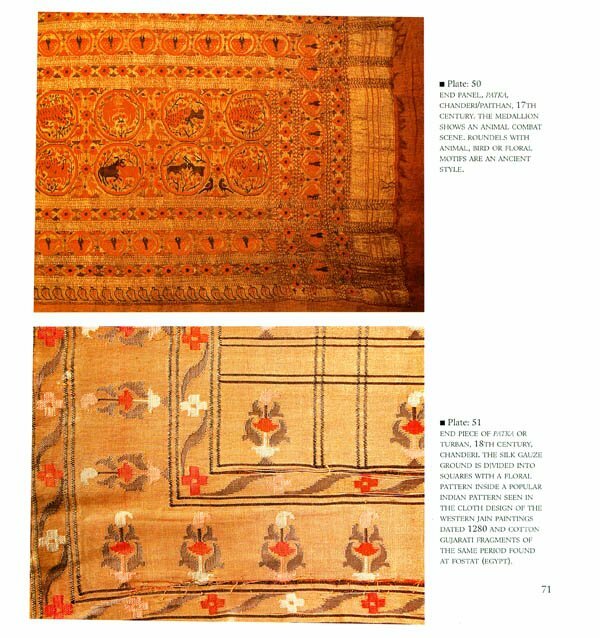 The narrative shows how Indian silk brocades grew to become world famous. Richly textured visuals accompany the words throughout, greatly adding to the understanding and appeal of the subject. Ms Yashodhara Agarwal was born in a well-known aristocratic family of Varanasi. Her great-grandfather, the late Jagannath Das Ratnakar, was a famous poet in the Brajbhasha. Her father, the late Ramkrishna, was a scholar in his own right. Mrs Agrawal was educated in Varanasi, Banaras Hindu University being her alma mater. She studied Museology and obtained an M.A. in the History of Arts and was awarded the University medal. In September 2001, she received her Ph.D. A recipient of the British Council Visitor Fellowship, the Greek Government Fellowship, and the Indo-French Exchange Programme fellowship, she has travelled widely and visited museums in the UK, France, Austria, Italy, the Vatican City, Greece, and Germany. Presently she is the charge of the Textile & Decorative Art section in Bharat Kala Bhavan, a museum of Indian art in Banaras Hindu University. She has a number of publications to her credit. Textile have fascinated mankind since ancient times. Many highly developed civilsations, beside their other achievement, produced incredibly refined and elaborately designed textiles each created its own distinctive patterns, employed unique techniques , and utilised the raw materials available in the region, which were hermp, cotton, wool or silk. It is regrettable, that in spite of the vast production of a diverse range of textiles over centuries by civilisation renowned for the excellence of their textiles, Indian, Hellenic, Egyptian, Mesopotamian, Achaemidian, Sassanian, Assyrian and Chinese, only a minuscule fraction of fabic samples have survived the depredation of time due to their fragility. Fragments of ancient fabrics in museums worldwide have been of invaluable help in discovering and understanding the historical background of textiles. Fabric found in Egyptian tomb, cotton fragment of the Indus Valley Civilisation excavated at MohenjoDaro, and silk and linen found in Center Asia at Chinese Turkestan sites (along the silk route) by Sir Aurel Stien throw a flood of light on the processes by which man created a multifarious range of exquisitely design textiles. Both India and China produced silk of two kind: domesticated and undomesticated (which was also referred to as wild silk). In China sericulture was a highly organized industry under royal supervision, while in India it was mostly in the hands of the tribals of the area. Though India's speciality has traditionally been cotton, it was also known for its fine linen and silk fabrics. That silk fabric were made in India in ancient times is corroborated by textual reference in India literature. 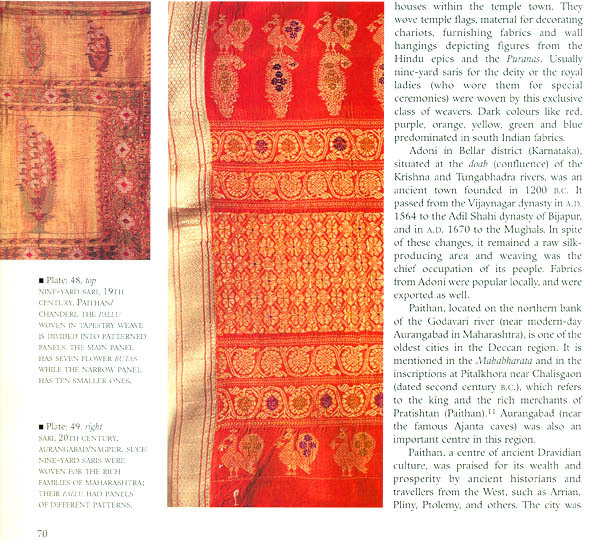 Ancient Indian text refer to silk as kausheya, kriminag, kitsutram, pattasutra or pattron etc. These were varieties of wild silk, such as tassar, eri or munga, which were produced in particular part of India such as Assam, upper Bengal, Madhya Pradesh and Orissa. This silk was obtained from the cocoon. Hence, it was Buddhist monoks who otherwise preferred cotton. However, Indian silk was considered inferior in quality to Chinese silk- Hiuen Tsang, the Chinese traveller in the seventy century , referred to it as 'wild silk' . Till the second century A.D, China was the only producer of fine mulberry silk. The introduction of sericulture in Khotan and other Central Asian countries along the silk route ( a name coined by Baron Ferdinand von Richtafen in the nineteen century ) ushered in a new era in the history of silk production. The inhabitants of Central Asia and other countries on the silk route benefitted the most from the silk trade, people living in oases, as well as the tribes, the earliest agents who transported silk products and transferred the technology of silk weaving and sericulture' (Silk and Region, Xinru Liu/p.19) Through Chinese silk was still considered the best, it began to face stiff competition from the silk produced in these countries. Chinese silk was introduction to India by traders ( mainly from Samarkand and Bukhra), and it gained immense popularity among the royalty and the aristocracy. These fabrics and yarn were exported to the West via the regular trede routes by India trader, both by land and sea. Ancient Chinese text mention a place named Huangche, which has been identified by scholars as Kanchi in south India - a silk brocade- weaving and trade centre. The expertise of India dyers in the art of dyeing fabraic in permanent luminous colours also might have encourged this trade via India. The terms hiranya drapi (golden drape), hiranya chandataka (golden skirt), or hiranya pesas (gold embroidered), mentioned in ancient Indian texts, the Rigveda and the Atharvaveda Samhita, are the earliest references to Indian gold brocade. These gold and silver brocades (referred to later as kamkhwab or kinkhab) may have been similar to ancient fabrics such as stavaraka or debag, described as rich material of Persian origin, woven with silver and gold thread. The sun god, Surya, is described in early literature as being clad in a coat of stavaraka. A fabric such as this is also mentioned by Banbhatta, the seventh century scholar in the court of King Harsh Vardhana of Kanauj. He refers to it as tarmukta stavaraka, a brocade decorated with a border of pearls. He also mentions the hansa (swan or goose)-patterned material called hansa dukula, a fabric used by the gods and kings. Some linen and cotton fabrics were at par with silk, such as dukul, kshauma, netra and tiritpatta. The Indian psyche was greatly• influenced by nature's resplendent beauty - the sun, moon, stars, rivers, trees, flowers and birds. Subsequently, these images were ascribed meanings or used as references for the elaborately developed religious and spiritual themes in India's three major religions - Hinduism, Buddhism and Jainism. These classical motifs were incorporated in all art forms. A symbol-specific study, focusing on any particular motif, would yield a rewarding meaning - of interconnection and co-relation between its form and use in paintings, architectural carvings, textile designs, ceramics, metallurgy, jewellery, tile patterns, armament decorations, and so on. These religio-spiritual traditions, while divergent, developed side by side over many centuries, and therefore mutually influenced each others' usage of symbolism. A study of the motifs found on the pottery of the Harappa civilisation reveals that certain motifs were common to a vast region, including India, Iran, Iraq, Afghanistan and Egypt, right up to parts of the Greek islands. (This is further corroborated by archaeological findings of sculpture, terra cotta figurines and textile fragments.) The study reveals the amazing persistence of certain motifs over a period of three or four thousand years. The existence of figural and geometrical motifs such as trees, creepers, lotus flowers, bulls, horses, lions, elephants, peacocks, swans, eagles, the sun, stars, diagonal or zigzag lines, squares, roundels, and so forth, can be traced through the entire span of Indian art. Some became the speciality of a certain region or centre. These motifs occurred in almost every form of decorative art, including textiles. Silk-weaving centres in India developed in and around the capitals of kingdoms, holy cities or trade centres. Well known silk brocade weaving centres were in Assam, Gujarat, Malwa and south India and the migratory nature of the weavers helped in the development and creation of many new centres. Natural calamities, political or social reasons, a fall in patronage or non-availability of raw materials, usually drove them away in search of riew centres. For example, many Gujarati weavers migrated to centres such as Tanjore, Trichinapally, Burhanpur, Chanderi and Varanasi due to repeated famine in their state. The centres developed in the north were Delhi, Agra, Fatehpur Sikri, Lahore, Kannauz, Mau, Azamgarh, Murshidabad and Varanasi. Though Varanasi was an ancient weaving centre for fine cotton and linen fabrics, silk weaving in its present form was introduced here much later, may be around the late seventeenth century. Some of the finest textiles were made in the royal workshops, references to which have been found since the Mauryan period, third to first century B.C. This tradition was followed by later Indian kings including the Muslim rulers of the medieval period. Besides India weavers from the renowned brocade weaving centres of Persia and central Asia, such as Yezd, Susa, Ur, Khotan, Bukhara, Samarkand and Kashgar were employed in their royal workshops to make special fabrics for the royalty. According to the fourteenth century Arab traveller, Ibn Batuta (in Rehla), four thousand khazzaz (silk weavers) were employed in the atelier of the Delhi Sultan,Mohammad Tughlaq who made fabrics for royal needs. The techniques and designs introduced by them influenced the Indian weavers as well. They were also influenced by the trade in foreign brocades conducted through the ports of Surat and Bharuch in western India, evident particularly in the Gujarati brocades. Rich materials were the exclusive prerogative of the creme de la creme of society, the rich and powerful merchants and noblemen, who not only could afford them but could even commission weavers to make fabrics for them. Particularly after the disintegration of the Mughal Empire many weavers worked for such new patrons. Religious functionaries too used these rich fabrics for their decorations and rituals. Well known south Indian temples had their own weavers to make materials exclusively for temple use.